Trace the story of how Mildura became an irrigated oasis in the midst of an arid land. In 1847 the Jamieson brothers were granted a licence to take up land for pastoral use. 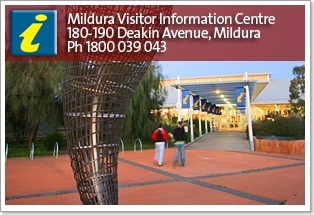 In 1858 this site was officially named Mildura. George and William Benjamin (WB) Chaffey were developing an irrigation settlement in Ontario, California when they heard of Victorian Cabinet Minister Alfred Deakin's visit to the region. Deakin was appointed by the Victorian parliament to visit America on a fact finding mission. The Chaffeys' model irrigation settlement impressed Deakin, who in turn impressed them with the potential for irrigation from the Murray River in Australia. 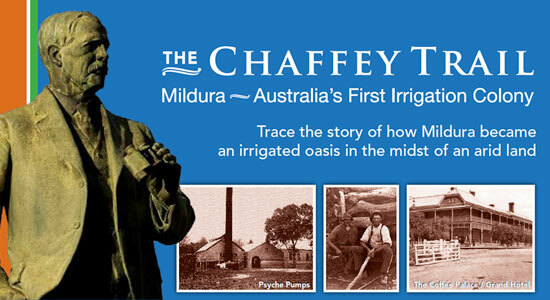 The Chaffey's brothers subsequently came to Australia and after protracted negotiation, in 1887 purchased the then defunct pastoral lease and created the Mildura Irrigation Colony. The indenture was signed on 31 May 1887 between the State Government and the Chaffey brothers. The Chaffey's adapted the plan of Ontario to the present site of Mildura. They developed a series of steam-driven pumps to lift water from the Murray River, first into King's Billabong then subsequently to various heights to irrigate up to 33,000 acres. The Chaffey brothers wanted to make Mildura a vibrant community. Their plans included many visionary concepts : an agricultural college was needed and to finance this one property in 15 was designated as college lease land now providing funding for schools. Prominent locations were made available for churches and facilities for clubs were encouraged. Parks and town transport were considered â€“ together this gave us the picturesque centre plantation of Deakin Avenue, surely one of the finest thoroughfares in Australia. Lanes and streets were laid out in all the town planning making Mildura the beautiful place it is. The Chaffey story begins with a wonderful interpretation and film about the Chaffey brothers at the centre. You are invited to view the informative video production of the “Chaffey Trail” in the theatrette, detailing the history of irrigation in the region and the Chaffey brothers. Open 7 days showing every half hour commencing at 9.30am with the last film screening at 4.30pm. 180-190 Deakin Avenue, Mildura. Telephone (03) 5018 8380. Reprinted with permission from the Mildura Rural City Council. Developed by the Chaffey Trail Reference Group, Chaired by Cr Mark Eckel. For further enquiries and updates, please contact the Chaffey Trail Project Officer on 03 5018 8311, or email chaffey.trail@mildura.vic.gov.au. Disclaimer: Whilst every endeavour has been made to ensure complete accuracy, the publisher cannot be held responsible for any errors, changes or omissions. Times and prices subject to change without notice.